This is one of my favoured snowstars because it’s so pretty and lacy and sweet. 🙂 It is very easy to make and fast too. It looks best when made with good yarn. Natural and organic yarns are pricey unfortunately, but they are also more quality. 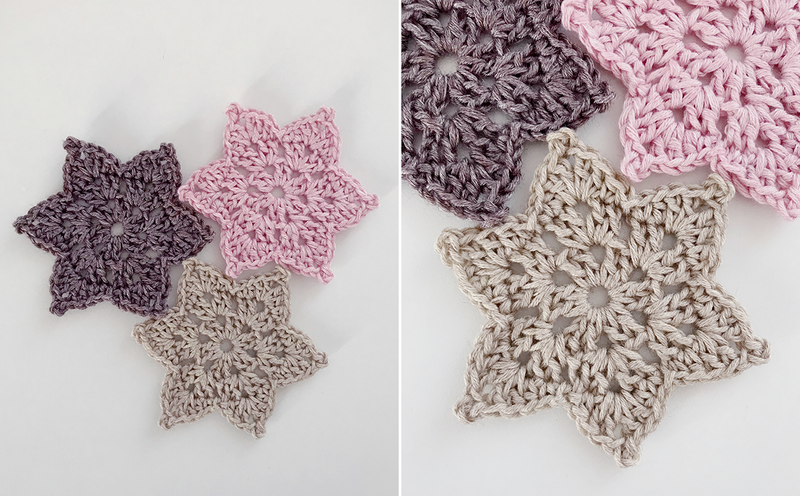 For these stars I used Concept – Cotton Cashmere and Tencel-Merino yarn by Katia. The pattern is written in US terminology. 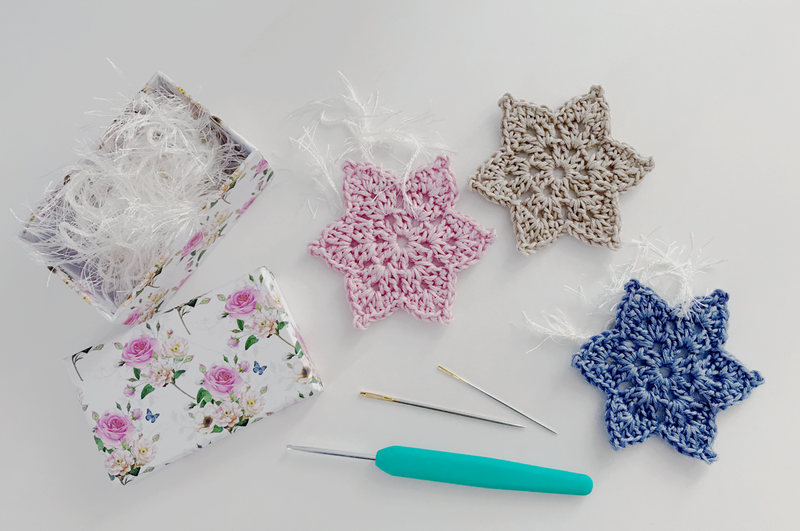 You will need yarn, crochet hook suitable for your yarn choice, a larger needle to weave in the ends and some fancy thread or ribbon to use as hanger. Some people like to stiffen the ornaments. See Google for stiffening suggestions – this is something I haven’t done yet. 1. ch3 (counts as first dc), dc, ch 2, *2 dc, ch2* 5 more times, end with sl st in top of ch3 (12 dc, 6 ch2 spaces). 2. sl st in next dc, sl st in next ch2 space, (2 dc, ch2, 2 dc) in same space, ch1, skip next 2 dc, *(2 dc, ch2, 2 dc) in next ch2 space, ch1, skip next 2 dc, repeat from the star until end. Sl st on top of first dc made in this round. 3. ch1 (counts as a sc), hdc in next dc, (2 dc, picot, 2 dc) in next ch2 space, hdc in next dc, sc in next dc, sl st in next ch1 space, *sc in next dc, hdc in next dc, (2 dc, picot, 2 dc) in next ch2 space, hdc in next dc, sc in next dc, sl st in next ch1 space, repeat from the star 5 more times, end with a sl st in the starting ch1. 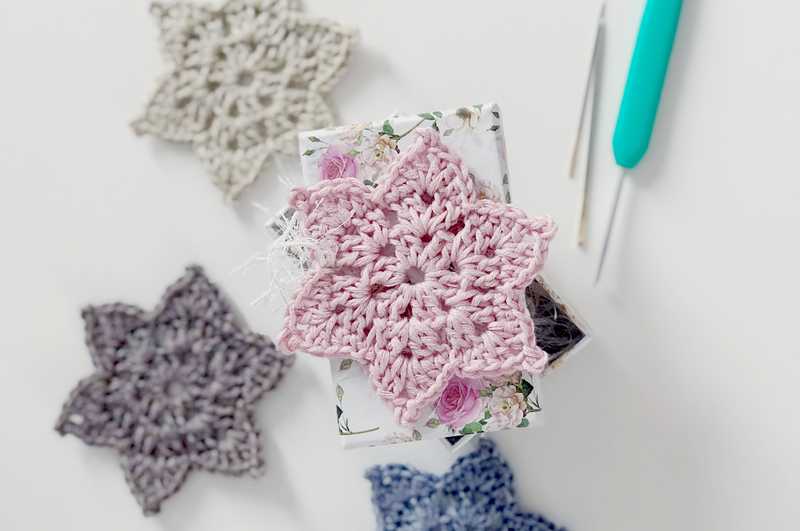 Cut yarn, weave in ends, stiffen if desired and attach a ribbon or something of your choice in between two of the star’s corners or on top of a corner. 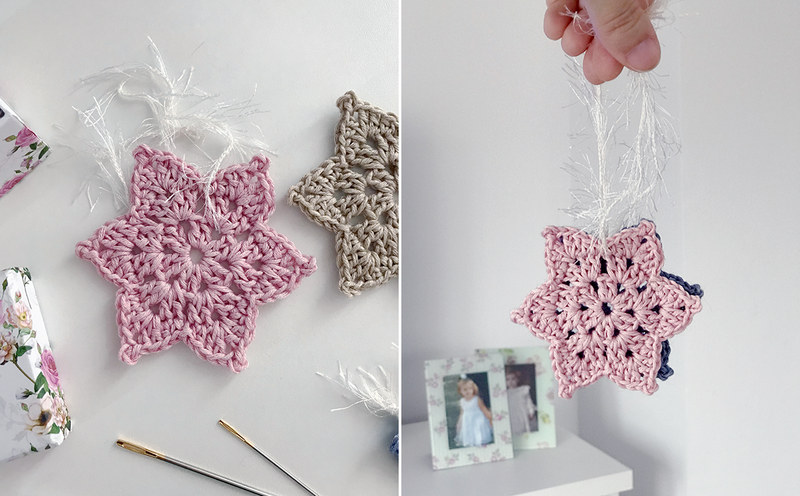 I am going to hang mine in a white tree, so I used pieces of this fuzzy yarn as a hanger. It makes me happy to hear that! Beautiful. 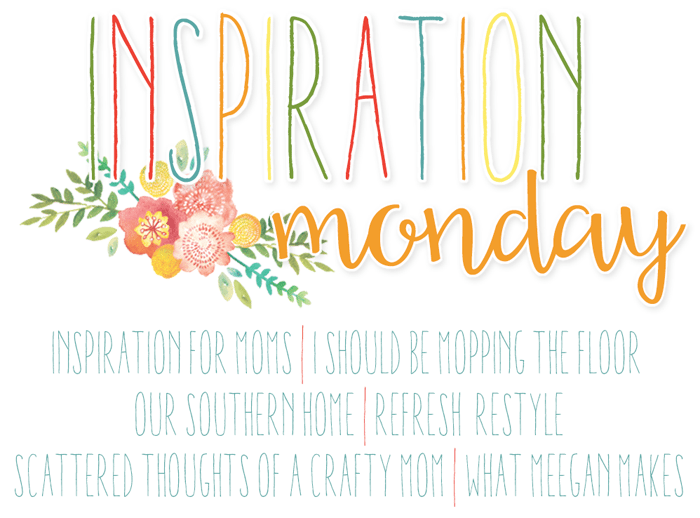 I don’t have a crafty bone in my body. I sure wish I could make these. So lovely! I’m horrible at knitting. You are amazing. Well, I always say that if I learned, everyone can learn. lol But I guess you need passion for it as well. I just love crochet.